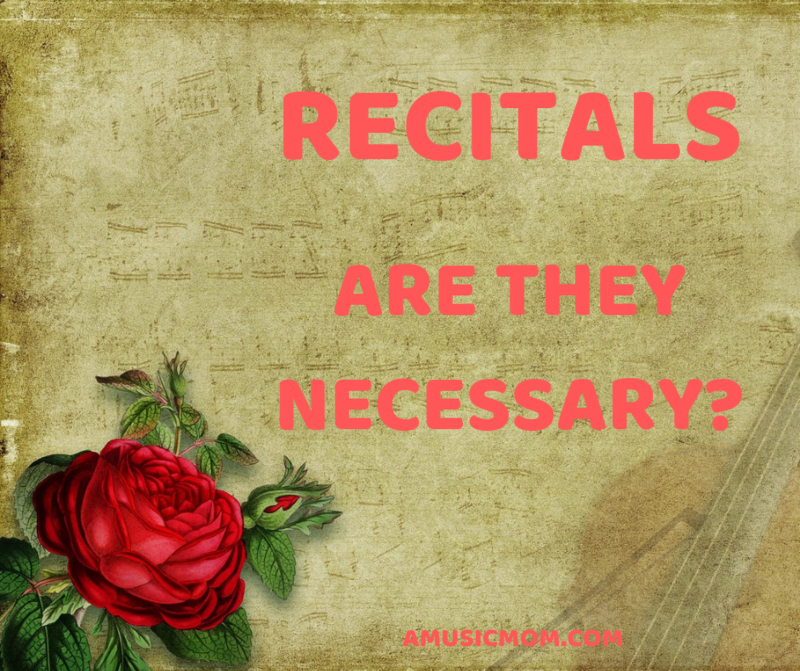 Recitals – Are They Necessary? Recitals. Not everyone’s idea of a good time, but still, recitals are important for your music student. We are getting close to the time of year when many teachers and studios have their winter recitals. I know what you are thinking – is this recital really necessary? I have so many other things to do! How is this going to be of any benefit to my child? Guess what? Teachers don’t plan recitals because they need to fill up some empty time in their schedules. They are just as busy as you are! Recitals are good for your child, and I am going to tell you why. How will a recital benefit my child? 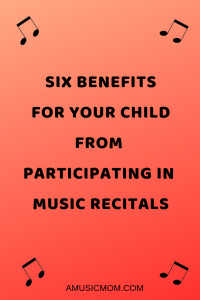 Six benefits for your child from participating in music recitals. A recital is a great way to celebrate accomplishment. Your child has practiced well. He has worked hard and learned new music. He can play his music well. The recital is a great way for him to show off his accomplishments. A way to demonstrate the results of all that hard work. A recital gives your child the opportunity to learn about adapting and persevering. Let’s face it, things happen at recitals. The piano may be different than what your child is used to. She might forget something about her music. She may be very nervous to play in front of an audience. Mistakes often throw off concentration. Your child needs to learn to adapt and continue. Recitals are great forums for that. Everyone attending the recital is on her side, inwardly rooting for her to go on, continue, finish. We learn from experiences. Recitals are opportunities to learn and practice social skills. Children need to learn to gracefully accept praise. Learning to say “thank you” to a comment on their performance is an important social skill. Recitals give children the opportunity to be supportive of others – to be a supporting friend to the other recital participants. They can learn empathy by supporting their friends who had a difficult time. Recitals are a great time for them to learn proper concert behavior. Things like not talking when someone else is playing. Not walking around during someone’s performance. Respecting others and their performances. Recitals are also a great learning opportunity for important life skills. How many times in life do we have to stand before a group and make a presentation? Whether it is for work, at church, in social settings, almost all of us do that at some time. And it can be nerve-wracking to stand in front of others. Recitals can help your child better learn how to perform in front of others. This can prepare them for things they may face later in life. Learning to be comfortable in front of others is a great life skill! Recital performance can give a great boost to a child’s confidence. You know how it feels to be praised for a job well done. That is the sense your child will get when he plays his piece and hears the applause of the audience. He thinks in his head, “I did it, and they liked it!” What a boost to a child’s self-confidence! Recitals can also be a great source of inspiration for your child. How can you help your child prepare for a recital? Make sure they practice and learn their music. The better they know their music, the less nervous they will be. Understand the requirements of the day. Will they need to announce their name and the name of the piece? Practice that in advance. Be an audience for them. Pretend they are giving a concert just for you. Invite the grandparents to be an audience. Give them opportunities to play for others in advance of the recital. Make sure they know you love them and support them, even if they make a mistake. Plan ahead, be organized, and get there in plenty of time. Being late, having to rush, will just add to any panic or nerves your child might be facing. Have your child dress up. A recital is a big deal. Treat it as such. Let your child dress appropriately. Have your child look professional. You don’t have to buy new fancy clothes, but skip the jeans with holes, and the ragged hoodie. This is a special occasion. Plan to stay for the entire recital. Give your support to the other participants. Let your child hear the others play. Some of the others may inspire him to keep working! Plan for your younger children. Bring books, activities, or crayons to keep them quiet and in their seats. Be respectful to others. Teach them to applaud for others. If you video your child, please be discreet. Don’t stand in front of others. Do take pictures, but don’t embarrass your child by your behavior. Consider bringing a small gift for your child’s teacher. Flowers might be appropriate, perhaps a gift card. My girls’ violin teacher loved our pumpkin bread, so we frequently brought a loaf for her at recitals. She put in a lot of work to prepare the recital. Show appreciation of her efforts. After the recital – Celebrate! Celebrate your child’s hard work, efforts and accomplishments. Celebrate your child. It doesn’t have to be something big but make it special. It could be dinner out, maybe an ice cream cone, something special. Our favorite Chinese restaurant was close to our violin recital location. My youngest daughter often requested that we stop there after her recitals. Celebrate your child, not perfection. Look at recitals as learning opportunities and ways to celebrate your child’s efforts. Enjoy the day, and you will give your child some great memories. Share some of your recital experiences in the comments. 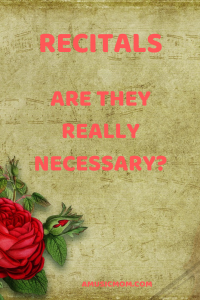 Recitals – are they really necessary? Previous Previous post: What’s the Big Deal about Major Scales?